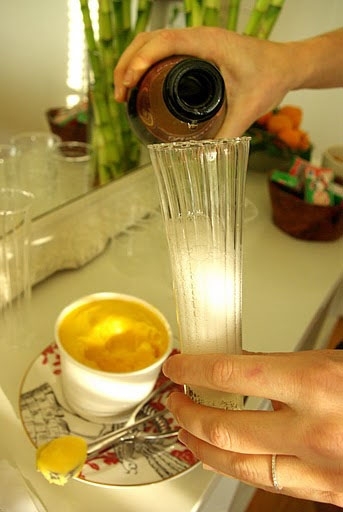 Every experienced hostess knows that one of the best ways to make guests feel at home when they arrive at your door is to hand them a cocktail. Better yet — set up a self-serve drink station so they can customize their concoction. Setting up a self-service station can be as simple as opening a bottle of wine and a bottle of sparkling water, or as involved as a full spread of liquors and mixers. For a large family gathering, shower, or festive dinner party, we love to set up a prosecco bar. 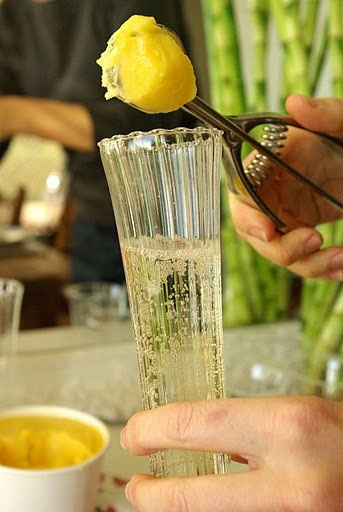 Prosecco is a light Italian sparkling wine similar to French Champagne, but at a quarter of the price. 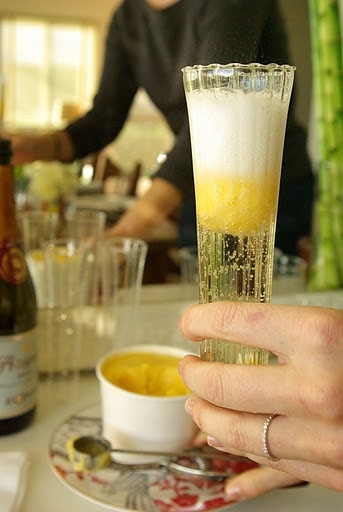 A nice bottle of prosecco will cost you about seven to ten dollars (we love Zonin Prosecco, found at our local Trader Joe’s) Arrange a few bottles in an ice bin with an array of sorbets and juices, then invite your guests to mix to their hearts’ desire. And for those who don’t imbibe — make sure to have plenty of sparkling water to combine with the sorbet or juice for a non-alcoholic mocktail. • Sorbets (choose one or two): A mini scoop of sorbet in a chilled glass of prosecco dissolves slowly, flavoring the drink and keeping it chilled. Just make sure to add the prosecco first and the sorbet second — sounds counterintuitive, we know — or you’ll have a mess on your hands. • Juices and Purées (choose one or two): When using these mixers, combine 2/3 cup of Meyer Lemon Simple Syrup to 1 cup juice. Pour into a squirt bottle or pitcher and chill until ready to use. Fresh squeezed orange or tangerine juice; pink lemonade; sparkling Italian sodas (blood orange or lemon works well); fresh or frozen peach purée (you can order it, try Ina’s recipe, or use Looza peach nectar). • Garnishes: Fresh raspberries and whole strawberries. • Essentials: Prosecco, sparkling water, Champagne flutes, tall spoons or stirrers, cocktail napkins, and mini ice cream scoops. Click here to see more Stocking the Bar tips!